UPDATE: “Nile Arnall”, a Bristol-based solicitor that many demonstrators used, has closed down. We have removed their details from our new bust card, so please use these instead of the old ones. Don’t panic. You are not alone and it’s not the end of the world! Answer “No comment” to ALL police questions. Even during interviews and ‘casual chats’. Police may try to get you to incriminate yourself and others – but whatever they say, there is no legal requirement to talk to them. 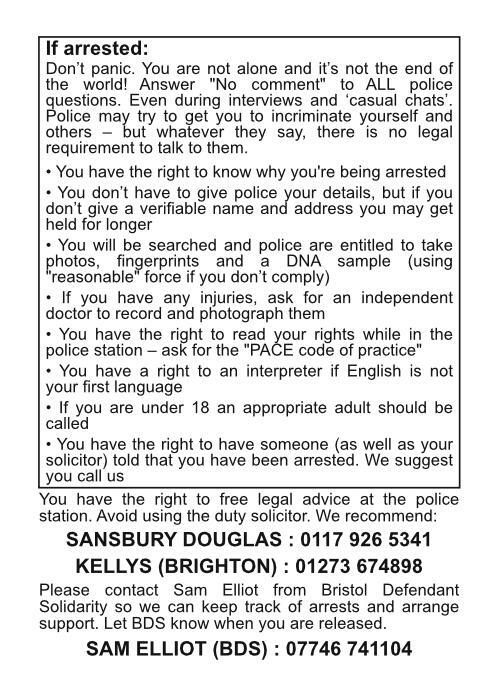 Please contact Sam Elliot from Bristol Defendant Solidarity so we can keep track of arrests and arrange support. Let BDS know when you are released. There are no “friendly” chats with the police. They cannot be trusted. Avoid contact and conversation with them, as everything you say can be used in evidence against you or others. Stop and search – Before a search you must be told the name of the cop searching you, the reason you are being searched and what “power” (what law) you are being searched under. You do not have to give your name and address or answer questions under any search power (unless driving). That said, if police “reasonably” believe an individual has committed anti­social behaviour, they can be required to give their name and address under s50 of the Police Reform Act. Police have the power to demand the removal of masks under 60AA of the Criminal Justice and Public Order Act, but ONLY if a section 60 or section 60AA order is in place. If you see an arrest – Write down a description of the person arrested, where and when it happened, and any other relevant information. Then call Arrest Support (BDS ­ 07746 741104). 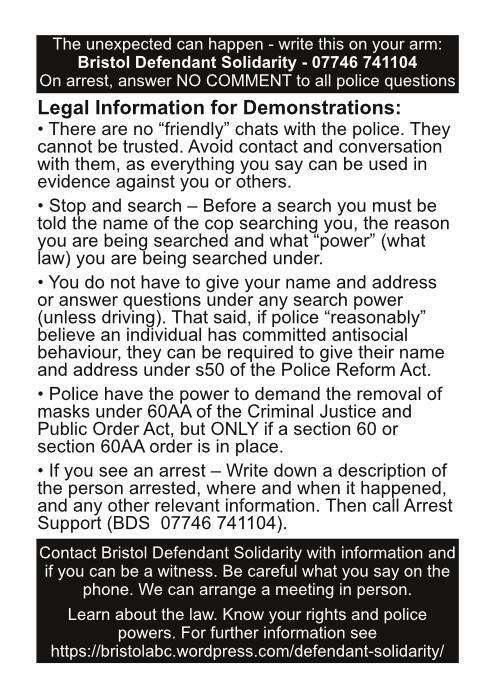 Contact Bristol Defendant Solidarity with information and if you can be a witness. Be careful what you say on the phone. We can arrange a meeting.